Balcikanli, C. (2013). Book review: The applied linguistic individual: Sociocultural approaches to identity, agency and autonomy. Edited by Phil Benson and Lucy Cooker. Studies in Self-Access Learning Journal, 4(3), 219-222. The Applied Linguistic Individual: Sociocultural Approaches to Identity, Agency and Autonomy, edited by Phil Benson and Lucy Cooker, maps the parameters of the concepts “identity, agency and autonomy” in relation to sociocultural approaches and illustrates how a range of different areas, as well as research studies, shape the concepts. This edited book offers a representation of voices through its 13 chapters contributed by researchers in various countries. The first chapter states two main objectives to be fulfilled by the book. First, it provides an analysis of theoretical re-interpretations of previously published work in terms of its treatment of individuality. Secondly, it offers an overview of empirical research findings that are likely to affect the concepts concerned. 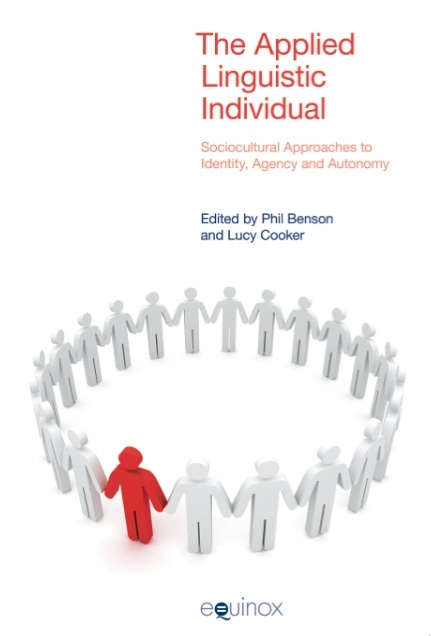 In the first chapter, editors Phil Benson and Lucy Cooker take the term “individuality” as a starting point and present the following views: “Language learning is a social process in the double sense that it is grounded in social interaction and conditioned by social, cultural and historical contexts and language learning is a uniquely individual process” (p. 1). The editors report that there was too much emphasis on the effort of identifying “an acquisition process that is common to all learners” rather than paying attention to “individual learner factors”. It is the aim of the book, then, to explore some of the theoretical and empirical challenges of working within the concept of “individuality” in Applied Linguistics. Chapter 2, by James P. Lantolf, who himself claims that he has not followed developments in the area of learner autonomy from the time of Holec’s introduction of the concept, makes a connection between sociocultural theory and dialectics of learner autonomy/agency. The chapter addresses issues of identity mainly through the idea that individuals emerge from socialization processes, involving socialization into language use and concludes that any educational activity should enable students to deal with the difficult circumstances by employing scientific knowledge they gain. Chapter 3 was written by Martin Lamb who takes a deeper look at Situated Learning Theory in connection with individual language learners. The chapter makes a rigorous analysis of the theory which focuses mostly on acquisition and development of new identities in communities of practice and suggests that individuals, being important participants of multiple communities of practice, and their identities be understood as dynamic and complex. Only then can learners make use of language in different communities. Chapter 4, written by Tomoko Yashima, discusses imagined communities from an Asian EFL perspective in a globalizing world. By starting with the phenomenon “the social turn in applied linguistics”, Yashima introduces two major sociocultural perspectives on research and practice: “The cultural historical/Vygotskian perspective and the post-structuralist/critical perspective” (p. 46). The author finishes the chapter with the suggestion that L2 learners trying to craft new identities can make progress as long as imagination functions to relate what they have acquired in classrooms to the communities they take part in. Vera Lúcia Menezes de Oliveira e Paiva in Chapter 5 focuses on terms “chaos and complexity” and their connections with the concepts “identity, autonomy and agency” in second language acquisition. By dwelling on the role of science in trying to understand any phenomenon to account for chaos/complexity science and second language learning, the author demonstrates that the ways in which learners take on different identities in response to the affordances proposed in various communities are expected to drastically alter the learners’ behaviors. To this end, it becomes clearer that successful learners, who are ready to take risks, experiment and explore will be many more in classroom settings. Chapter 6 was written by Phil Benson, one of the editors. After a brief introduction of the overlapping terms such as self-directed learning, self-instruction, individualized learning and learner-centered, Phil Benson explores the conception of identity in the context of Autonomy Theory and focuses on the ways in which language and social identities become more individualized as learners gain knowledge, experience and autonomy in second language learning. In Chapter 7, Jane Kehrwald touches upon the social construction of learner autonomy, beliefs and identity in second language learning. The project she describes in the chapter is based on developing learner autonomy in a specific learning environment through the exploration of the learners’ beliefs. The chapter concludes that autonomy is a complex combination of self-regulation and investment and focuses more on identity and socially triggered agency. Chapter 8, by Anne Pitkänen-Huhta and Tarja Nikula, is concerned with teenagers making sense of their foreign language practices by means of the use of individual accounts which display social discourses. The authors’ ethnographically oriented study focuses on the ways in which Finnish teenagers use English in their daily contexts, what values and meanings they give to it, and more importantly how they position themselves as learners of English. The findings of the research the authors conduct indicate that the learners see their learning experiences not only as a cognitive process but also as an active engagement and participation in activities related to language learning. In Chapter 9, Mingyue (Michelle) Gu reports on a study which centers around the stories of two Chinese learners of English. The aim of the study is to examine the changes they experience in their L2 identities over a course of time in an EFL setting and how they construct their L2 identities in the face of both the spread of English that accompanies globalization and also the rapid changes in Chinese society. Finally, the study raises the question of how individuality is constructed as the learners constantly interact with different contexts. Ashley R. Moore, in Chapter 10, discusses the ideal sexual self in a Japanese setting. The study explores how five Japanese individuals construct their identities as self-identifying gay men across varied sociolinguistic contexts. Attempting to investigate overlapping factors that belong to individual accounts and how their experiences affect their motivational levels in learning English, the study suggests that the experiences the five learners go through in the process of language learning in Japan may show similarities to those of other gay learners across different contexts. Chapter 11 was written by Anne Whiteside who discusses data from her doctoral study of language practices of Mexican migrants to the United States. Using concepts from Complexity Theory and Language Ecology to take a deeper look at dynamic social tensions in the linguistic practices of the participants, the study focuses on face-to-face and cell phone conversations immigrants are engaged in. The complex interaction of historical and individual memory and how they structure the behavior of an idiosyncratic person have been seen as the main findings of the research. Matthew Clarke, in Chapter 12, takes up the theme of teacher identity within an autonomous perspective. The author explores an approach to sustaining professional agency and self-empowerment in the formation, development and deployment of a teacher identity. Employing Foucault’s ethical work, the study outlines and exemplifies two vignettes of novice language teachers with a great emphasis on Sociocultural Theory and Situated Learning Theory. To close the book, the editors review all the chapters concerned and return to the theme “Applied Linguistic Individual” which they view as a paradox in social approaches to Applied Linguistic Research. Seen as a whole, the book examines the concept of applied linguistic individual for language learning from three different angles namely identity, autonomy and agency. It starts from theoretical considerations that are provided through a literature review spanning both education research and applied linguistics, and it moves to the description of empirical implementations in different settings. Rather than bringing diverse projects and perspectives together through theory, it embarks its readers on the open-ended exploration of an exciting multi-dimensional field. Dr. Cem Balcikanli works as Associate Professor in the ELT Department of Gazi University, Turkey. He is also Vice Director of The School of Foreign Languages, Gazi University. He has published articles on learner/teacher autonomy, use of Web 2.0 technologies in language learning/teaching and teaching Turkish as a foreign language. He takes an active part in the in-service training programs of the Ministry of Education as a trainer and has contributed to a number of projects run by the Ministry for primary, secondary and tertiary levels.